Zebrafish (Danio rerio) is increasingly being employed for evaluating toxicity and drug discovery assays. Global swimming behavior could be a simple readout for toxicity, easy to scale-up in automated experiments. 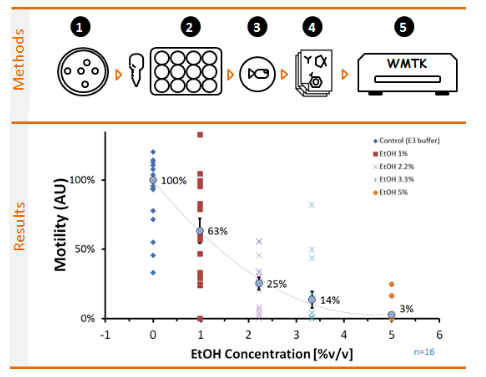 This approach is potentially applicable for fast ecotoxicity assays and whole-organism high-throughput compound screening, reducing the time and money required to evaluate unknown samples and to identify leading pharmaceutical compounds. Fish toxicity measures are easily implemented using our WMicrotracker system. Below you’ll find a procedure example. In this experiment we can observe the effect of EtOH on zebrafish larvae behavior after 48h of drug exposure. The plot shows the average activity and the natural variability of response between animals (n = 16 per treatment). (1)Collect fertilized eggs in a petri dish with E3 medium. (2)Pass one to three 48-hpf non-hatched zebrafish embryos to each well of a 96-well plate. Get a final volume of 200ul of E3. (3) Incubate 48 h at 28ºC to allow hatching. (4)Add 22ul of a 10x concentrated solution of chemicals to test. Use four technical replicates. (5)Register larvae activity using WMicrotracker for a period of 15 minutes every 24h.